Each gram of ointment contains 500 units of Bacitracin in a low melting special base containing White Petrolatum and Mineral Oil. The antibiotic, Bacitracin, exerts a profound action against many gram-positive pathogens, including the common Streptococci and Staphylococci. It is also destructive for certain gram-negative organisms. It is ineffective against fungi. For the treatment of superficial ocular infections involving the conjunctiva and/or cornea caused by Bacitracin susceptible organisms. This product should not be used in patients with a history of hypersensitivity to Bacitracin. 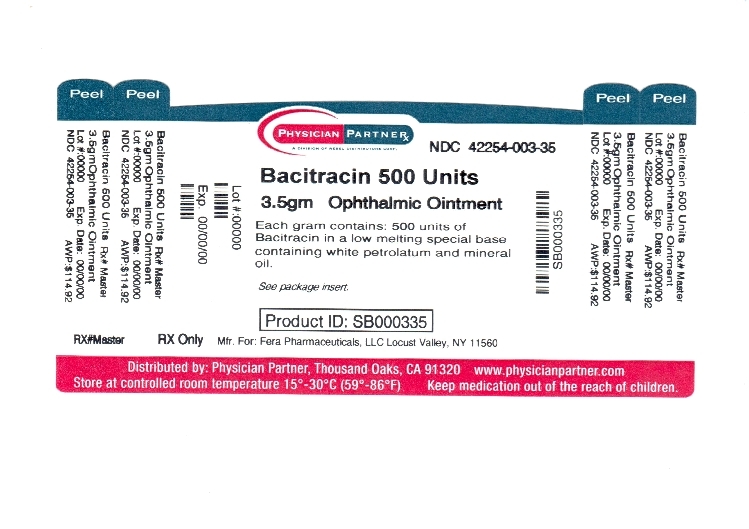 Bacitracin ophthalmic ointment should not be used in deep-seated ocular infections or in those that are likely to become systemic. The prolonged use of antibiotic containing preparations may result in overgrowth of nonsusceptible organisms particularly fungi. If new infections develop during treatment appropriate antibiotic or chemotherapy should be instituted. Bacitracin has such a low incidence of allergenicity that for all practical purposes side reactions are practically non-existent. However, if such reaction should occur, therapy should be discontinued. The ointment should be applied directly into the conjunctival sac 1 to 3 times daily. In blepharitis all scales and crusts should be carefully removed and the ointment then spread uniformly over the lid margins. Patients should be instructed to take appropriate measures to avoid gross contamination of the ointment when applying the ointment directly to the infected eye. 3.5 g (1/8 Oz) sterile tamper proof tubes, NDC 42254-003-35.